Photocards are a lightweight alternative to postcards or folded cards. 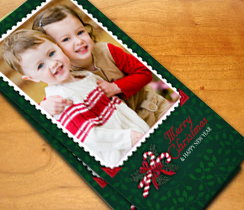 Your 4x8 greeting is printed on high quality glossy, matte, or lustre paper. Perfect for holiday greetings, save-the-date/engagement/birth announcements and party invitations.